Many just assume the science says what they want it to say, without recourse to the IPCC, NOAA, or a similar authority. For example, Paul Krugman (professor of economics at Columbia, Nobel Prize 2008) says this at his NYT blog. Similarly, Joseph E. Stiglitz (Professor of economics at Columbia, Nobel Prize 2001) in “Learning from Harvey” says this at Project Syndicate. Vapor visualization of a hurricane in the Weather Research & Forecasting Model. NCAR/UCAR. Although many on the Left ignore, misrepresent, or exaggerate the science, there is well-established data about these matters. Here is a look at recent research (i.e., since the IPCC’s AR5 report), the foundation for the statement at NOAA’s website that concludes this section. Red emphasis added. (a) Look at the trends in the number and intensity of hurricanes. “Ten years ago, Webster et al. documented a large and significant increase in both the number as well as the percentage of category 4 and 5 hurricanes for all global basins from 1970 to 2004, and this manuscript examines whether those trends have continued when including 10 additional years of data. “In contrast to that study, as shown here, the global frequency of category 4 and 5 hurricanes has shown a small, insignificant downward trend while the percentage of category 4 and 5 hurricanes has shown a small, insignificant upward trend between 1990 and 2014. Accumulated cyclone energy globally has experienced a large and significant downward trend during the same period. Update 2: A new article looks at hurricanes in the South Pacific: “Extreme tropical cyclone activities in the southern Pacific Ocean” by Karl Hoarau et al. in the International Journal of Climatology, in press. “This research concerning the South Pacific Ocean shows the 10-year and interannual variability of extreme cyclones (categories 4 and 5). The intensity of these cyclones has been reanalysed on the basis of GMS, GOES and NOAA satellite images with the Dvorak technique. In the period 1980–2016, 63 cyclones reached categories 4 and 5. During the decade 1980–1989, the intensity of cyclones of at least 115 knots over 1 min (100 knots over 10 min used by the meteorological centres in the South Pacific) was underestimated: we found 19 such cyclones, as opposed to 11 in IBTrACS, and 6 in the SPEArTC and in the Joint Typhoon Warning Center (JTWC) databases. “Between 1980 and 2016, the number of extreme cyclones did not show any tendency to increase. The 1983 season was the most active, with six cyclones of categories 4 and 5 that do not figure in the JTWC database for the South Pacific. Only one intense cyclone has been reported in the SPEArTC and five cyclones in IBTrACS in 1983. El Niño episodes concurred with a much higher number of cyclones of at least 115 knots than La Niña episodes. More than half of the category 5 (at least 140 knots) cyclones were observed during El Niño years. Update 3: Australia’s Bureau of Meteorology agrees that there has been no increase in tropical cyclones in ocean around Australia during 1970-2017 (report here). Update 4: “An Energetic Perspective on United States Tropical Cyclone Landfall Droughts” by Ryan E. Truchelut and Erica M. Staehling in Geophysical Research Letters, in press. Gated. (b) What powers the trends in hurricane intensity? Articles about hurricanes often say there is a strong and direct link to sea surface temperatures (SST). Reality is more complex. Philip Klotzbach explained his findings to me in more detail. Dr. Klotzbach is a research scientist at the Tropical Research Project at Colorado State U. “Our paper found that the large increasing trends in Category 4-5 hurricanes observed in Webster et al. (2005) were primarily due to changes in observational technology at the various warning centers. Most model projections predict a slight increase (on the order of 5-10%) in storm intensity, with perhaps fewer storms, over the next century. “SSTs correlate tightly with Atlantic hurricane activity, due to other large-scale climate features such as sea level pressure and vertical wind shear. In the tropical Atlantic, warm sea surface temperature anomalies result in lower tropical and subtropical Atlantic pressure. The associated weaker pressure gradient results in weaker trade winds, reducing vertical wind shear (since upper level winds blow out of the west in the tropical Atlantic). The weaker trade winds cause less mixing, evaporation and upwelling of the sea surface, which then feed back into reinforcing the warm SST anomalies in the tropical Atlantic. This wind-evaporation-SST feedback process in the Atlantic has been shown to be critical for the Atlantic Meridional Mode. Generally, positive values of the Atlantic Meridional Mode are associated with warm SSTs, low sea level pressure, and reduced vertical wind shear. The actual impact of the SST anomalies themselves is shown to be relatively small in partial correlation analysis. This was first demonstrated two decades ago in “Atlantic Sea Surface Temperatures and Tropical Cyclone Formation” by Lloyd J. Shapiro and Stanley B. Goldenberg in Journal of Climate, April 1998. (c) Cliff Mass describes the relationship of global warming to hurricanes. “Before the rains had ended, dozens of media outlets had published stories suggesting that global warming forced by humans (mainly by emissions of CO2 into the atmosphere) played a significant role in producing the heavy rainfall and resulting flooding associated with Hurricane Harvey. “Most of the stories were not based on data or any kind of quantitative analysis, but a hand-waving argument that a warming earth will put more water vapor into the atmosphere and thus precipitation will increase. A few suggesting that a warming atmosphere will cause hurricanes to move more slowly. (d) Roger Pielke Sr. tells me about an important but often ignored point. Dr. Pielke Sr. is a Senior Research Scientist in CIRES and Emeritus Professor of Atmospheric Science at Colorado State U. See his bio. (e) Judith Curry discusses the link between global warming and Hurricane Harvey. From her post about Hurricane Irma at Climate Etc. Dr. Curry is a professor emeritus at the Georgia Institute of Technology and President of Climate Forecast Applications Network (CFAN). See her bio. (f) NOAA gives their verdict. The bottom line comes from NOAA’s Geophysical Fluid Dynamics Laboratory: “Global Warming and Hurricanes – An Overview of Current Research Results.” Journalists should consider this definitive. But few of them mention it. A. 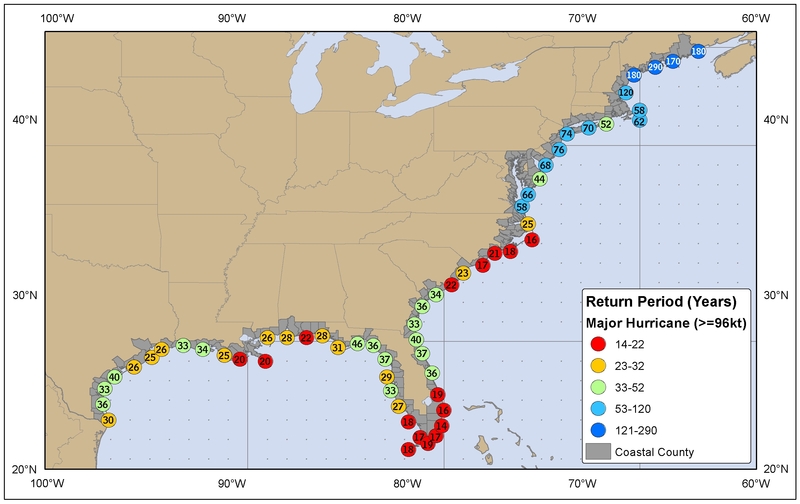 Statistical relationships between SSTs and hurricanes. B. Analysis of century-scale Atlantic tropical storm and hurricane records. To gain more insight on this problem, we have attempted to analyze much longer (> 100 yr) records of Atlantic hurricane activity. If greenhouse warming causes a substantial increase in Atlantic hurricane activity, then the century scale increase in tropical Atlantic SSTs since the late 1800s should have produced a long-term rise in measures of Atlantic hurricanes activity. We find that, after adjusting for such an estimated number of missing storms, there is a small nominally positive upward trend in tropical storm occurrence from 1878-2006. But statistical tests reveal that this trend is so small, relative to the variability in the series, that it is not significantly distinguishable from zero (Figure 2). E. Summary for Atlantic Hurricanes and Global Warming. (g) About “Hurricane Harvey’s Rainfall and Global Warming“, January 2018. Analysis by Christopher W. Landsea, the Science and Operations Officer at the National Weather Service’s National Hurricane Center. Excerpt from his conclusions. “Hurricanes (and Tropical Storms) have been associated for millenniums with extreme rainfall and freshwater flooding. There is nothing that one can do to prevent these storms from occurring, hitting land, and impacting people. Graphs from Ryan Maue (click to enlarge). He also notes that the “Southern Hemisphere 2016-17 tropical cyclone season was weakest/quietest in 50-years since reliable records (sort of) exist.” His dataset has 4,137 named global Tropical Storms since January 1970. Of those, 2242 has a period of hurricane level force (54%). Global frequency of tropical cyclones. Global accumulated cyclone energy (ACE) of tropical cyclones. The National Interagency Fire Center shows year-to-date statistics for wildfires in the US. This year ranks third in the past eleven years. The total acres burned per year have been in a flat range since 1999 (details here). In the 20th century forests were managed by Smokey the Bear — “only you can prevent forest fires” — in the mistaken belief that forest fires must be prevented. This made the western US forests into tinderboxes. The Left blames the resulting massive fires on climate change. Too see why that is not correct, read “Human Activity, more so than Climate Change, Affects the Number and Size of Wildfires” — Testimony of David B. South (Professor Emeritus of Forestry, Auburn U) before the Senate Subcommittee on Green Jobs and the New Economy, 3 June 2014. It has a wealth of information and useful graphs. Much of the propaganda about Harvey and Irma has been directed at Trump. How has his job approval levels changed — an instant measure of their success? Harvey made landfall in Texas on August 26. Trump’s job approval numbers began to improve on September 1 and have remained flattish since September 3 (graph as of Sept 15). Lots of firepower expended on Trump to no visible effect. — Steven Mosher (of Berkeley Earth), a comment posted at Climate Etc. The debate about the best US public policy response to climate change has run for three decades, with Left and Right relying on misinformation and exaggeration to influence the public. We should be able to agree on the need to prepare for the inevitable repeat of past weather — like category 3, 4, and 5 hurricanes hitting the east coast. It is pitiful that a rich nation like America has hysterics from events so commonplace as a cat 3 hurricanes. We should be prepared for the on average six major hurricane landfalls per decade (see the average return period for each section of the East Coast. Eventually a cat 5 will hit the center of a major city. Then perhaps we will take some simple steps to build a more resilient America. To learn more about the matters discussed here. See the records set by Irma – at Weather Underground. See some thoughts by an engineer about these disasters: “After Hurricane Harvey, don’t empower the engineers” by Charles Marohn at the Strong Towns website. Lots of good material at this site. See NOAA’s information about hurricanes: their records page and about years with the most hurricanes. Irma might defeat the skeptics and end the climate wars – a thought experiment. It’s an indicator that belief in climate change has shifted a bit into superstition. There were some similar quotes from prominent people, including scientists. I didn’t include them because I already have a full roster of enemies. Excellent and clearly written summary. Roger Pielke Sr. (not Smith). Thanks for catching that. Some typos re incomprehensible. How did that happen? Gremlins? Living in the San Francisco Bay Area, I’m interested in trend of California’s wildfires. Here is some news about a new paper about this..
See a summary of this story: “Over the last 40 years, there is a surprising trend with California wildfires” in the Orange County Register. Great graphs. The bottom line: fewer fires but more acreage burned. The paper discussed is “Different historical fire–climate patterns in California” by Jon E Keeley and Alexandra Syphard in the International Journal of Wildland Fire, Vol 26 nbr 4, 2017. “Wildfire has been an important process affecting the Earth’s surface and atmosphere for over 350 million years and human societies have coexisted with fire since their emergence. Yet many consider wildfire as an accelerating problem, with widely held perceptions both in the media and scientific papers of increasing fire occurrence, severity and resulting losses. However, important exceptions aside, the quantitative evidence available does not support these perceived overall trends. “Instead, global area burned appears to have overall declined over past decades, and there is increasing evidence that there is less fire in the global landscape today than centuries ago. Regarding fire severity, limited data are available. For the western USA, they indicate little change overall, and also that area burned at high severity has overall declined compared to pre-European settlement. “Direct fatalities from fire and economic losses also show no clear trends over the past three decades. Trends in indirect impacts, such as health problems from smoke or disruption to social functioning, remain insufficiently quantified to be examined. Thank you for posting this interesting article. To get max attention to it, I added a full cite and the abstract to your comment. Also, I’ll add a mention of this to the post. Pingback: What you need to know and are not told about hurricanes | Watts Up With That? In summary: Repent. The end is near. One of the classic headlines, producing profits for millennia! Some things never change. Pingback: Cutting through the myths about Irma, Harvey, and climate change. | Watts Up With That?